Have you ever said a word so many times that it starts to sound weird? I strangely can remember sitting in the basement with my friend probably fifteen years ago laughing at how weird the word 'yellow' sounded like after we repeated it a dozen times each, laughing hysterically at how it began to seem like such a foreign word, yet it wasn't at all. I don't think we often think about things that we see, say or do everyday. Instead, all of these things have become apart of us in a way they are so familiar our mind doesn't need to process it. It isn't until we stop and think about it do things really shine in a different light. 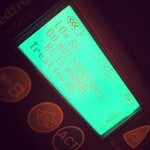 The other day I got up and my insulin pump got stuck in the couch - which is a common occurrence for me. After fishing it out of the crack of the couch I started to think about the insulin pump in a different light despite wearing it for the past 2.5 years. I stopped for a second and realized just what I was wearing and the fact that it has been on me for 2.5 years, on vacations, in bed and at school. It started to look weird and my mind started thinking of it more as something unusual that how ordinary it actually was to me. I thought about how strange it is that there is a site in my body always and tubing that delivers my medicine in me. Syringes seem more logical in the sense that people get needles all of the time, but the pump, well now I was thinking of it as one of the strangest things I had ever decided upon. Keep in mind I wasn't doubting my choice on picking a pump, nor was I having a moment where I wanted to throw it out the window, instead I was looking at it just as if I had said the word yellow fifteen times in a row. Of course, it didn't take long to realize, yes, Kayla, you've decided this, yes, it is kind of a weird concept, but it works and it fits my lifestyle. But, I found it interesting how something that I haven't really 'taken off' in 2.5 years all of a sudden had to be reviewed by myself. Our minds work in weird ways, or maybe just mine! It's not strange that you've decided upon the pump Kayla, you figured it's work for you and it has. For me, I know the pump would not work. I have no desire to have one, so I continue to use the syringe. I also have no desire for the pen. I have to use COLD insulin, which I know sounds strange to most diabetics because to most cold insulin hurts them. Now to me that is strange. Because the cold insulin never hurt me. No when I had to start using my insulin cold, I could feel it going in and that felt strange. Now I can no longer feel it. But if I use warm insulin, it's like the insulin has gone bad, it doesn't work. Talk about strange. I think it's funny that you used a word that I cannot use because my sister over uses it... weird. She can use it 5-6 times in a conversation. Too often for me.